Living in an apartment building provides some outdoor obstacles we try to combat. While we do have a small hill (very exciting) next to our apartment entrance, we do not have a fenced in yard. Sometimes I dream of the day I can slide the back door open and say, "go out and play," while looking at the kids out the kitchen window. As for now, we will have to be a little more creative in creating outdoor experiences. We are blessed to have many parks surrounding us. They might actually outnumber the Starbucks! We do make plenty visits to various parks, but that is not quite the same thing as playing in the back yard. There is a tennis court in our complex and a few afternoons I took the girls to the court, and let Aislynn run around in this fenced in green asphalt play pen. We took some balls over the other day and she spent a good amount of time throwing them back and forth over the tennis net. Last week we played a little family tennis I use the term "tennis" extremely loosely, and hit some balls around. And I do mean around, not so much back and forth, since Aislynn confiscated our rackets and balls throughout the "match." Tennis takes on a whole new meaning when it includes 2 little girls. When we were first married, Andy and I used to go play tennis together, and we would actually break a sweat from our rigorous play. Now I am breaking a sweat from having an 18 LB warm little body on my back while I try to bend over to get the ball. Last night in my overly ambitious state, I suggested we all head over to the court for another family "match". We all put on our tennis shoes and I put on Isla (on my back). I found a little racket for Aislynn, since on our last tennis day, she seemed extremely interested and territorial with our two rackets. Of course now that she had her own racket, the interest was minimal and she soon found gathering up the tennis balls and putting them back in the tube to more exciting. This was only a problem when the balls she wanted to gather up, included the ones we wanted to hit around! However, this problem was soon remedied by her realization that there were a series of small puddles in the court next to ours. We do live in a "luxury" complex you know (at least that's what the sign says), so we have 2 playing courts! I think children are drawn to water of all kinds. It is like this magnetic force. Besides being totally grose, dirty, germ pools, I think puddles are fun. Aislynn thinks they are even more fun. 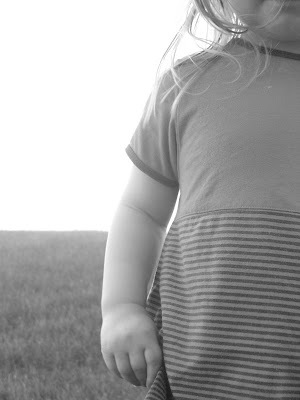 In her mere 32 months of life she has already made many "puddle memories" some which I encouraged, many which I did not. 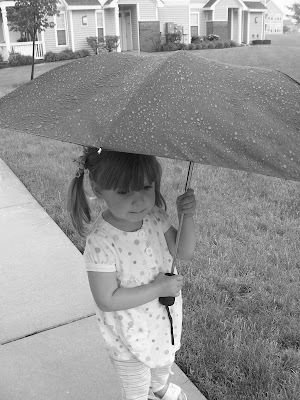 The other day I let her stand outside in the rain, holding an umbrella (don't worry, no thunder). She was out there for a good 15 min before I made her come in. What is it with kids and water? We'll dive into that question on another day! Back at the tennis court, Aislynn did her regular circling of the puddle, like a wild animal and then began to "pounce" quite similarly to a wild animal. Although her "pouncing" involved splashing in hydrogen and oxygen and a little bacteria I am sure. I looked at her happily splashing away, and thought, "what's the harm, she'll take a bath after this and she is conducting experiments! I love it!" First she stomped slowly, then faster, than she ran through it, touched it with her hands. Although none of these things would be ok with many parents, I am not one of those parents. However what happened next, definitely would not be ok with any parents including me. Aislynn quickly bent down and tried to lick the puddle water, "Yuuuuuummmmy!" She exclaimed, she really does drag that word out. I immediately shouted, "NO LICKING THE PUDDLE!" Three words I did not envision myself yelling when I decided to let Aislynn "experience life" in the form of playing in dirty water. She just looked at me almost shocked that this was not considered proper puddle etiquette. And I looked at her almost shocked that my little girl with sensory food issues found it more troubling to lick a piece of pineapple than to lick a dirty puddle. It only made sense that the next thing she did was sit down right in the largest puddle. As I went to shout my next round of "I thought these puddle rules went without saying" words, I just sighed, realizing her whole back side was completely wet. Might as well let her experience getting wet. I would like to clarify that I do not condone my child sitting in puddles on a regular basis, and I will probably kick myself for letting her do so, since now she will think this is acceptable to do. But on this particular occasion, on this night, in this tennis court, in that outfit, right before a bath, it was ok. And believe me, it didn't stop there, she as practically rolling through the puddles, at which point we decided to reel her in. We felt we had given her more than enough freedom to experience puddles for one day-probably more like an entire year! Reluctantly, Aislynn left her puddles. Actually leaving these pools of water was such an emotional experience for her that she had started to cry before we escorted her off the court. She looked up at me as we walked away, almost soaked from the waist down, and said "Wipe the eyes?" She was apparently bothered by the water in her eyes from her tears, the other 50 percent of her that was wet, not so much. I wiped her eyes with the corner of my shirt. "Thanks Mom," she said.